I have my personal reasons to want to start a movement to put an end to this stupid month forever. For instance, we were only five days into February last year when, without warning, we lost my dearest and oldest friend Vicki. And then this year an old friend, someone I was friends with from first grade through the beginning of high school also passed. That was not unexpected. I was fortunate to see her again after 40 years just this past summer, when we dined together with another old and current friend, who feels her loss as I feel Vicki’s. I’m sure after this year many of you would consider joining the movement to abolish February for your own reasons. Throughout the country we have suffered an onslaught of nonstop horrible weather, not just dotting the end of the winter as February has been known for, but prolonging it making us fear it would never stop. My holiday blues stretched nearly beyond their limit and could have snapped in a weaker person. Reports of my poor cousin, south of Boston, spending hours upon hours out in the cold on his tractor, clearing away pounds and pounds of snow, over and over again, make me ashamed to complain, but I’m doing it for all of us. It is not just due to the occurrences over the last couple of years that prompt my contempt for the month, it’s the obvious stuff. First, it’s hard to say correctly and even I, who can be a stickler about such things, more often than not will skip the first R and simply say Febuary. (Note: If abolishment is not possible, we should at least change the name to Feblueary to better reflect my state of mind.) Then of course there’s that bizarre day thing. When trying to remember how many days in a particular month, don’t we run through our heads, even recite out loud, “Thirty days have September, April, June and November. All the rest have thirty-one, except for February…” Then who remembers how the rest goes or what it even means. It’s without rhyme or reason, literally. Wouldn’t it be best to say “31 days are in September, April, June and November. All the rest have 32, because we’re not crazy. And how are you?” I will leave it to the experts to figure the redistribution of days and factoring the solstices and whatnot throughout the 11 months we are left with. 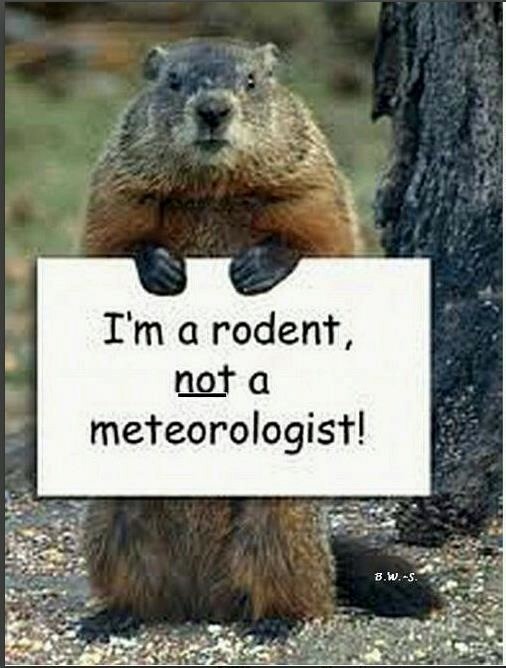 We would do away with those nonsense holidays like Groundhog Day that can only be annoying to the poor creatures, who are saddled with the responsibility of predicting the weather, an ability they have proved time and time again not to have, and I’m sure they don’t want to be burdened with. Do we not get that by now? Last year, my city’s very tall mayor dropped a groundhog, which resulted in its death. I don’t blame the mayor, I fault our adherence to silliness on behalf of tradition. Please don’t get me started on Valentine’s Day. (Seriously, don’t get me started because I have a story about last year, that all I will say about it is, the good news is there was no one to disappoint me this year. Really, all I asked for was a cozy dinner at my place, no flowers, chocolates or stuffed animals clinging to hearts.) And then there are those people who call it Valentime’s Day. I do like the holidays that have historical relevance – President’s Day and Martin Luther King’s birthday. I was one of those who originally objected when we started moving all the holidays to Mondays out of convenience. Now, I like it. Just don’t touch the 4th of July. As March is one of the longer months and has no holidays that close the office for the day, both those February holidays can move there. I understand that the people with February birthdays may be reluctant to shift their own special days, but not if we offer them the opportunity to pick their new birthdays from any of the 365 days and to subtract two years from their ages as an added bonus. I know I would change my birthday from the end of November when Thanksgiving frequently interferes with celebration plans, opting instead for a lovely spring day. If we put our heads together, this could work. I can’t be the only person that has ever thought of it. I accept no responsibility for my weight set-back, nor for my lack of initiative to work on my writing projects other than the blog and all the stuff I do for the job that pays the bills. I blame February.